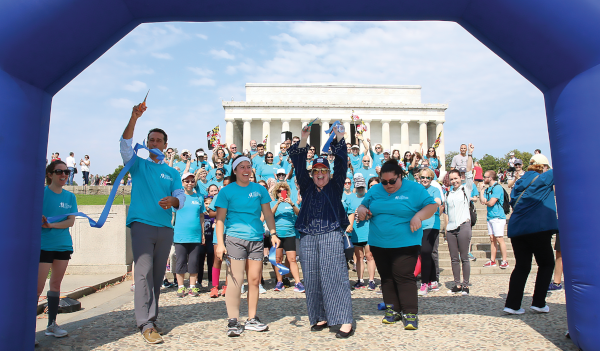 In the public realm, you may have noticed popular celebrities such as Kathy Bates and Steve Guttenberg talking about the impact of lymphedema (LE) on their lives. You have probably also noticed that the educational meetings you attend have an increasing number of sessions focused on the diagnosis and treatment options for LE. A perfect example of this change is reflected in the adoption of the new name the American Vein and Lymphatic Society (AVLS), formerly ACP, which cements that professional society’s commitment to LE. Although LE affects more Americans than multiple sclerosis, muscular dystrophy, AIDS, Parkinson’s disease and ALS combined, it is a disease that often goes unrecognized by medical practitioners. One study showed that the average medical school graduate had received only fifteen minutes of instruction on the lymphatic system during their entire education. This leaves the general practitioner at a disadvantage in diagnosing the many forms of primary and secondary lymphedema that arise. Thus, begins a vicious cycle. Uninformed physicians lead to patients who aren’t provided a name for their disease. Without a name, patients don’t know where to turn for treatment or support. Too often, by the time they find that help, their LE has progressed to more debilitating stages of the disease. Equally as problematic has been a feeling among many physicians that LE is a minor event. Often, this was reported as a sentiment of oncologists who saw LE as an unfortunate consequence of cancer treatment. However, ask a cancer patient for their opinion and you will most often hear, “Lymphedema is worse than cancer. They cured my cancer, but lymphedema is forever.” One is likely to then hear of the litany of ways LE has robbed patients of even the most basic pleasures of life. Without question, one of the reasons physicians may feel that lymphedema was outside of their purview is because they have been offered few treatment tools. Even for those who might be able to diagnosis LE, patient care was most likely referred to a therapist able to do complete decongestive therapy (CDT). Physicians are routinely seeing edema cases where the underlying cause is not purely venous in nature and yet they continue to struggle with how to provide appropriate care for these patients. The Lymphatic Education & Research Network (LE&RN) was created in 1998 to fight lymphatic diseases and lymphedema through education, research, and advocacy. In the last five years, there has been a sea change. It was a nascent field when LE&RN began promoting lymphatic research 20 years ago. Today, there are laboratories around the world dedicated to studying lymphatics. This has led to one of the greatest breakthroughs that has been a boon to physicians—technology that allows us to see how the lymphatic system works. Surgeons have seized upon this research and now perform vascularized lymph node transfer (VLNT) to restore lymphatic drainage and lymphovenous anastomosis (LVA) to redirect excess lymphatic fluid into the vascular system. At the same time, clinical studies have begun to arise testing pharmacological treatments for the disease. Although big-pharma has still to take note of the progress being made, we move ever-closer to the day when they see the enormous need at hand and the opportunities that await. To move this plan forward, LE&RN tackles a variety of agendas. There is the funding of research, scholarships for young investigators and sponsorship of the Harvard Lymphedema Symposium and biennial Lymphatic Forum, both attracting worldwide researchers. On the physician front, LE&RN was funded by industry to create the seven-credit CME in Lymphatic-Vascular Disease Diagnosis and Treatment, which is available online for a nominal cost and free to members of American Vein and Lymphatic Society. To address the difficulty that patients have in finding comprehensive care, LE&RN established standards for Centers of Excellence in lymphatic treatment and is currently reviewing the first applications for this designation. And then there was World Lymphedema Day, March 6th, which was established by unanimous vote of the United States Senate based on a bill written by LE&RN. In parallel to the development and advancement of LE&RN’s mission, the AVLS, a professional medical society dedicated to the advancement of care in venous disease, began expanding its efforts to educate members and others in the field on the relevance and importance of understanding lymphedema and how to best treat those who suffer from LE. 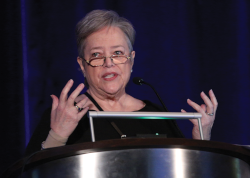 In 2016, at the Annual Congress of ACP, thanks to Bill Repicci and LE&RN, our effort was highlighted when Kathy Bates, the keynote speaker, honored those gathered. Ms. Bates would bring LE’s impact on the quality of life center stage. Springboarding from 2016, efforts in LE have continued to expand, culminating in 2018 when the ACP announced to the world that the name of the society would be changing to the American Vein and Lymphatic Society, specifically to embrace the realization that LE is a key part of its identity. As promising as these developments are, the greatest change to come will likely be forged by LE advocates. Five years ago, Academy Award-winning actress Kathy Bates became LE&RN’s spokesperson. Ms. Bates had developed LE in both arms after a double mastectomy. She is now a leading voice advocating for research and the attention of the medical community. This has led to meetings with the American Medical Association, National Institutes of Health, Centers of Disease Control and Prevention, Chan-Zuckerberg Foundation, as well as with our national political leaders. Ms. Bates’ activist stance has also led to unprecedented coverage of lymphedema in the national media. Add to this that over the last two years, Ms. Bates has led over 100 advocates attending LE&RN’s Lobby Days in Washington, DC. This is followed by a rally on the steps of the Lincoln Memorial. Demonstrating the new strength of the LE community, the state of New York passed a first-in-nation bill in 2018 that mandates all general hospital institutions to give LE information packets to any at-risk patient. As patients solidify their hopes and find their voice, our institutions are being forced to listen and act. Success is in favor of the millions with LE. These advocates are no longer silent. They are demanding new treatments and cures and they will be looking to researchers and physicians to provide these. Given that venous and lymphatic medicine has already emerged as a specialty, patients will be looking to these specialists to make good on their promise and usher in a new era of comprehensive care for those with lymphatic diseases such as LE. And the questions “Why me?” or “Why now?” can be better answered by physicians of affected patients. 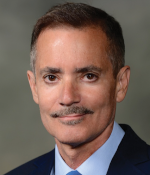 Dean J. Bender is currently the Executive Director of the American Vein & Lymphatic Society, formerly the American College of Phlebology. 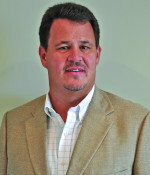 William Repicci is President and CEO at Lymphatic Education & Research Network (LE&RN).